General Plastics’ LAST-A-FOAM® FR-7100 multi-use polyurethane foam boards ably fill the bill for low-cost, easily finished, uniform stock material that won’t warp, twist or bow, whether under process or over time. Widely available in densities ranging from four to 40 pounds, this versatile workhorse supports a broad spectrum of uses. These include low-cost composite core applications; tooling and molds; architectural and styling models; CNC-machined topographical maps, prototypes and tool proofing; and industrial patterns, among other uses. FR-7100 is highly cost-effective to fashion and finish. This foam machines cleanly when using standard high-speed steel cutting tools and water jets, producing crisp lines. However, the foam is equally easy to cut by hand using simple woodcarving tools. Its fine cell structure and grain-free surface enable very smooth finishes. 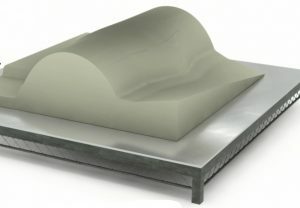 To achieve a smoother surface finish, higher density foam could be considered. Other inherent differences in the FR-7100 series’ formulations and physical properties make it ideal for specific industries. The most common applications are models and prototypes, marine, composite core, and tooling. The FR-7100 material truly shines as a medium for design models, product prototypes, topographical maps, environmental graphics, sculptures, carvings and industrial patterns. It is extremely easy to shape and carve with common woodworking tools. It cuts “like butter,” says General Plastics’ technical sales representative Sean Meehan, even with the use of sandpaper or other hand tools. For models and prototypes, the most common density range is 4 pounds to 12 pounds – and sometimes up to 15 pounds (the recommended limit for hand carving). Meehan adds that above the 12-pound range, the density used is subjective. 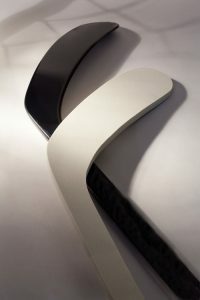 It typically depends on how the model or prototype is being used and the desired finish. 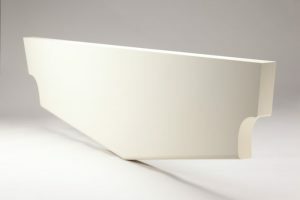 For extremely high-quality prototypes and models where a smoother finish is required, customers may choose the 20- or 30-pound density – and occasionally even specify 40-pound for an item that will be displayed. However, it’s actually rare to use densities higher than 20 pounds for prototypes and models. As a commercial-grade versus “spec” foam, the FR-7100 foam series offers a lower price point with high availability, critical for satisfying often-tight lead times. “While our standard ship time is seven days after order acceptance, it can be shipped sooner to ensure customers meet their schedules,” said Meehan. This LAST-A-FOAM® material’s superb value also explains its common use for prototyping and proofing applications. Oftentimes, customers machine a prototype made from our FR-7100 foam to ensure that everything is on-point and correct in their programming before machining the final product in a more expensive material such as aluminum. Even with long-term exposure, the FR-7100 product line does not absorb water or retain moisture. Its rigid, closed-cell characteristics prevent mold, mildew and any degradation of the material, making it an optimal composite core for marine applications. These include boat decks, transoms, engine mounts, freezers and non-load-bearing surfaces. Lightweight applications such as fish holds, for example, require superb insulation. The FR-7100 provides the highest R-value at 5.3 per inch when it’s glassed over, offering ample insulation for refrigeration. Since most fish holds have irregular shapes with a lot of contours, our material makes it easy to shape by hand using common woodworking tools. This application typically uses our 4 or 6-pound densities. “The density range for the canopies can be subjective, but often depends on whether any instruments will be mounted to those surfaces. If the boat will have a satellite or radar system, customers often lean toward the 15-pound density,” Meehan adds. 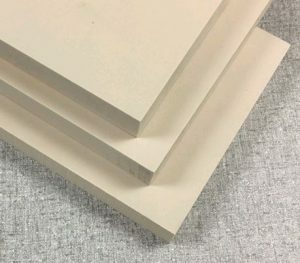 FR-7100 Multi-Use Core and Modeling Board foams are flame-retardant, strong, durable and dependable, satisfying diverse composite applications such as composite panel cores, machined foam parts, and composite layups. The foam series’ dimensional stability makes the material stress-free, eliminating any concerns that it will warp or bow. They are also chemically resistant with excellent compatibility with common resin systems and low resin uptake thanks to their fine cell structure which further reduces part weight and cost. This makes them ideal for fiberglass wet layup processing and resin transfer molding. These foams can be sealed and painted using a wide array of primers, sealants and paints, and they bond well with many adhesives. With FR-7100, there are no mold-release agents or other additives that could inhibit adhesion. It bonds easily to other composite materials and does not contain anything that could cause delamination of skins. Easy adhesion also applies to bonding boards of multiple densities together. For example, if specific surfaces require higher strength characteristics – such as a higher-load-bearing section of sandwich panel – high and low densities can be combined in one layup and bonded securely prior to machining and finishing. All densities of the FR-7100 series are appropriate for use within the composite core industry. What’s more, this product is offered in half-sheets, making it perfect when customers only require a small amount of material. Meehan cites the examples of boat and automobile manufacturers, or custom fabricators, who only need enough material to rework or refinish a small panel. “Not having to purchase a full 48” x 96” sheet is always a welcome cost savings,” he said. For tooling applications, the FR-7100 couples great machinability with excellent finish capabilities, and is well-suited to ambient layup processes such as casting molds at temperatures below 200ºF, thermoforming tools, mold patterns and low-volume vacuum-forming tools. Click to see density recommendations. Similar to model and prototyping applications, surface finish is an important factor in product selection. This multi-use foam series enables finishing with a wide array of materials and primers. It also supports use of many different sealants, critical for preventing material transfer. The number of pulls also frequently dictates product selection: Multiple pulls call for high-density FR-7100 foam, but for one-off tools, it’s often not needed. Engineering students participating in the Formula SAE Collegiate Design Series choose General Plastics Last-A-Foam® for their projects. These teams compete to design, develop and test a small Formula-style racecar, where the prototype is evaluated for its potential as a production vehicle. Such one-off tool projects, where students create a plug from which they pull a master mold, typically call for lower density foam. The product’s physical properties create a stress-free, no-warp material – imperative for tooling processes when any movement is undesirable. Users also appreciate the absence of additives or debris in the material that can cause damage to machining equipment. LAST-A-FOAM® FR-7100 Multi-Use Core and Modeling foam is available as board stock and blocks in densities from four to 40 pcf. General Plastics can also supply the foam needed and machine it in-house to satisfy customer requirements. Download the FR-7100 product data sheet and technical data sheet to learn more.